When we created our national fellowship, we sought to broaden our impact on the family engagement landscape by inviting educators and leaders from across the country to participate in a professional learning community of like-minded education professionals. Fellows applied as teams, bringing together stakeholders from across a state or city, from schools, district offices and local grantmaking organizations. We host convenings for the teams to connect online and in person over the course of the fellowship to learn and share from experts and from one another. 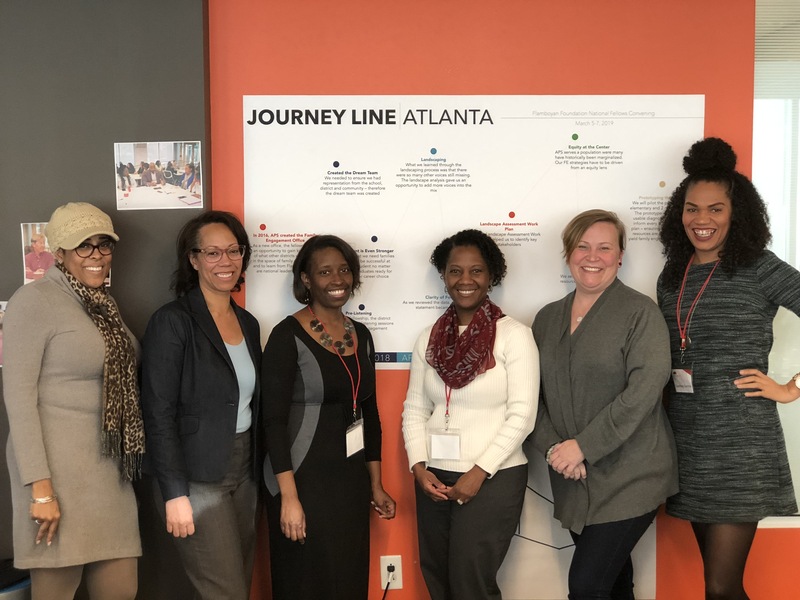 Our fellowship teams from Atlanta, Dallas, Memphis, Utah, and Milwaukee convened in Washington, DC as a cohort for the fourth time to kick off the development of strategic plans that aim to build a culture of effective family engagement in their communities. They’ve spent the past year deeply listening to stakeholders via complementary pilot initiatives. Teams started their time together by meeting across teams to reflect on their work to date through the use of journey lines that highlighted the impacts and lessons learned from their pilots, bringing past learnings front of mind as they prepared to design their strategic plans. After taking a look back at their journeys, the fellows began learning about how to draft their plans. Flamboyan CEO Kristin Ehrgood advised the fellows, to not “get wedded to your strategies, but do fall in love with your outcomes. Strategies come and go, so focus on what you’re trying to achieve.” She was joined by three powerhouse DC community advocates, Patrick Corvington of DCSRN, Maya Martin Cadogan of PAVE and Shanita Burney from DC Public Schools for a lively discussion about how they approach strategy, collaboration with stakeholders and building trust with local families during strategic planning. On the heels of the panel, fellows started to draft their plans. They chose breakout sessions with content experts, from Flamboyan staff, partners and members of the previous fellowship cohort, who provided consulting on topics like communications, evaluation, influence and equity. That’s what these convenings are all about; a safe space to wrestle with the work as part of a community of like-minded people seeking to create catalytic change in their communities. Learn more about our fellowship.